Rory McIlroy rued several missed chances as a four-under-par 68 left him eight off the pace after three rounds of the WGC-HSBC Champions event. "I didn't really make anything on the greens," said McIlroy. The world number three said he was "100% healthy" after suffering food poisoning earlier this week. American Kevin Kisner leads on 16 under, a stroke ahead of Dustin Johnson, China's Li Haotong and Scotland's Russell Knox. Unlike his playing partners, Kisner and Branden Grace, Knox exercised his right not to play the final hole as darkness descended in Shanghai. Knox will have to get up early on Sunday morning to play the 18th before the final-round action begins at the World Golf Championship event. World number two Jordan Spieth fired the round of the day, a flawless nine-under 63, to move into a share of fifth spot, three behind Kisner. 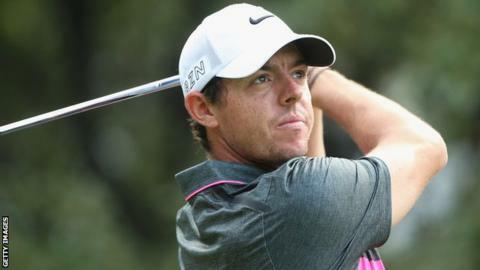 Race to Dubai leader McIlroy accepts that his chance of clinching victory have probably gone after he was unable to make a significant move on Saturday. "I needed to go a little bit lower to give myself a chance going into (Sunday), but I'll try to finish off the tournament with a good score and getmyself into the top 10 or the top five," said the 26-year-old.